Bangkok Airways pioneers as the first airline to implement the direct route between Bangkok and Cam Ranh. The city, known as the "Riviera of South China Sea", is situated on the Southeastern coast of Vietnam and is only 30 minutes away to Nha Trang which is one of the most desired beach holiday destinations along with a myriad of sightseeing and recreational activities; Buddhist temples, gothic-style Catholic churches, natural hot springs, salt fields, and unique waterfalls. Moreover, having a link to Cam Ranh will make it easier for passengers traveling aboard Bangkok Airways' codeshare partner airlines from around the world to connect to Dalat and Mui Ne, then on to Ho Chi Minh City. 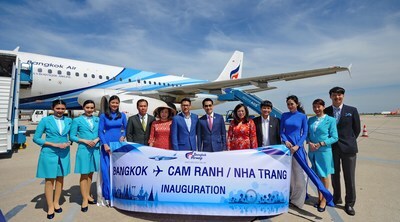 Cam Ranh is the fourth destination in Vietnam adding to Bangkok Airways' route network after a successful performance on Bangkok -- Danang, Bangkok -- Phu Quoc and Chiang Mai -- Hanoi flights launched earlier in May 2016, October 2017 and March 2018 respectively. The airline operates four flights a week (Monday, Wednesday Friday and Sunday) with a 144-seater Airbus A319 aircraft, starting from 25 January 2019. The outbound flight PG993 will depart Bangkok (Suvarnabhumi Airport) at 10.20hrs and arrive Cam Rahn International Airport at 12.05hrs. The inbound flight PG994 will depart Cam Ranh at 12.55hrs and arrive Bangkok (Suvarnabhumi Airport) at 14.40hrs. All passengers of Bangkok Airways can enjoy a boutique lounge at Suvarnabhumi Airport where passengers can treat themselves to a multitude of free snacks and various choices of hot or cold drinks, free Wi-Fi Internet access. For Bangkok Airways' business class or passengers with FlyerBonus Premier Membership can enjoy extra treats at the Blue Ribbon Club Lounge that offers more services such as hot meals, a personal shower room, a massage parlor, as well as a nice and quiet personal library room, which can also be used as a personal meeting room.